It’s showtime! 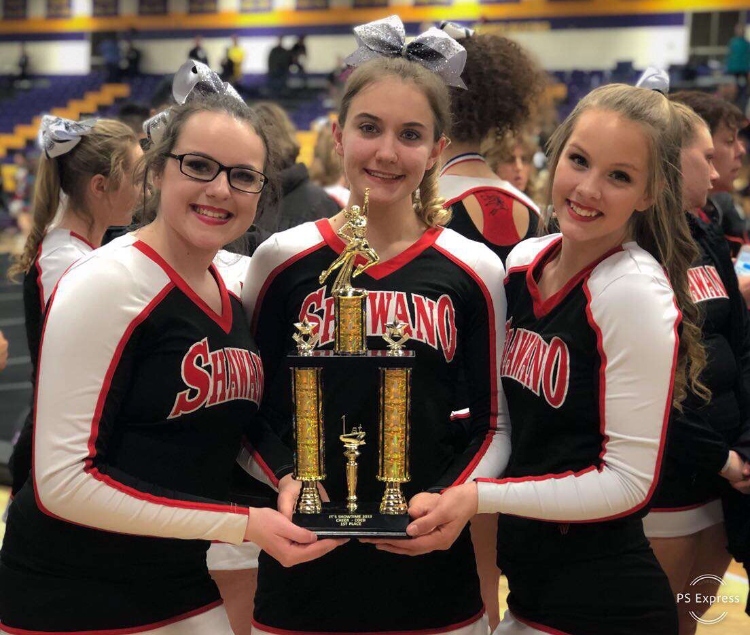 The Shawano Community High School [SCHS] Cheerleading team recently competed at their first competition of the season. The “It’s Showtime” competition was held in Stevens Point on Sunday, Jan. 20, 2019. The team danced, tumbled and cheered their way to a first-place victory. The cheerleaders also won Shawano Cheer’s first ever division championship by outscoring 13 other teams. Seniors Hannah Kadonsky, Payten Marohl and Emily Watters lead the team to success in their final season. The seniors had mixed emotions about the upcoming season. Watters and Kadonsky were equally saddened about the realization that they were entering the final stretch of their cheer careers. Kadonsky will be cheering in college, but Watters is still undecided. “I’m really sad. This cheer team is my whole entire life. Yes, they [teammates] get on my nerves, but I wouldn’t be the person that I am today without them,” said Watters. Although the team will miss the seniors for the coming seasons, they look forward to working with the freshmen athletes that were recruited this season. Abbie Rabideau and Kaylee Rindt were the newest additions to the competition team, and “It’s Showtime” was the first of hopefully many competitions in their cheerleading careers. “Going into the competition I didn’t know what to expect. I was really just excited about our first performance in front of the judges. It was a good environment to be in with people that I have gotten to bond with,” stated Rabideau. The team did not go into the competition expecting to place as well as they did. They collectively expected to place third or second but were very pleasantly surprised at the way the day played out. “I was surprised but thrilled. Our routine wasn’t perfect, and we were up against some pretty good teams,” said Kadonsky. Watters, Marohl and Rabideau had similar thoughts. They all agree that the team’s performance was not the best that they can do, and look forward to improving greatly in the coming weeks. Along with drilling the routine, the team plans to focus on bonding more. 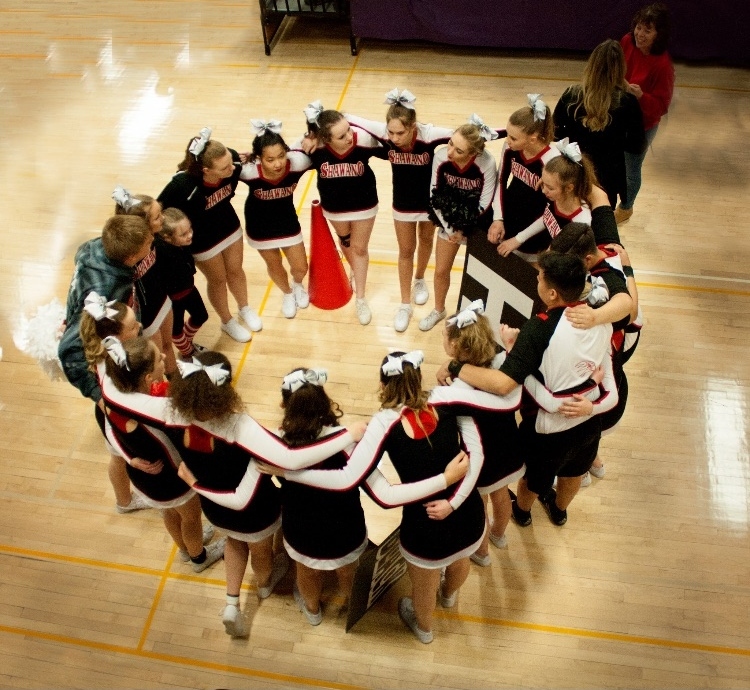 Cheerleading is 110 percent a team sport, and one person that has trust issues within the team can determine if the team places first or last at a competition. “I feel like the team meshes really well. Although we do work hard and put pressure on one another at practice, we all make an attempt to find some time to hang out and bond outside of practice. There are always ups and downs, but we all want the same thing,” said Quandt. Although it may seem like the season has just begun, the girls are already looking forward to the state cheer competition. They have set goals as individuals, as well as for the team, and do not plan on giving up the chase for gold anytime soon. “My goal is for us to work the hardest that we can, and be the best that we can be. It’s my last season, and I want us to get out there and make Shawano proud. Leave it all on the mat,” stated Marohl.